With a 3x action formula, Gillette Series Sensitive Men's Shaving Gel hydrates, protects, and soothes your skin. Formulated with aloe, Series Sensitive Shaving Gel helps protect your sensitive skin against the 5 signs of shaving irritation: Nicks & Cuts, Tightness, Redness, Burning and Stinging. 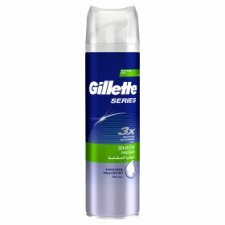 For an incredibly comfortable shave, use Gillette Series Sensitive Shave Gel with a Gillette Mach3 razor.